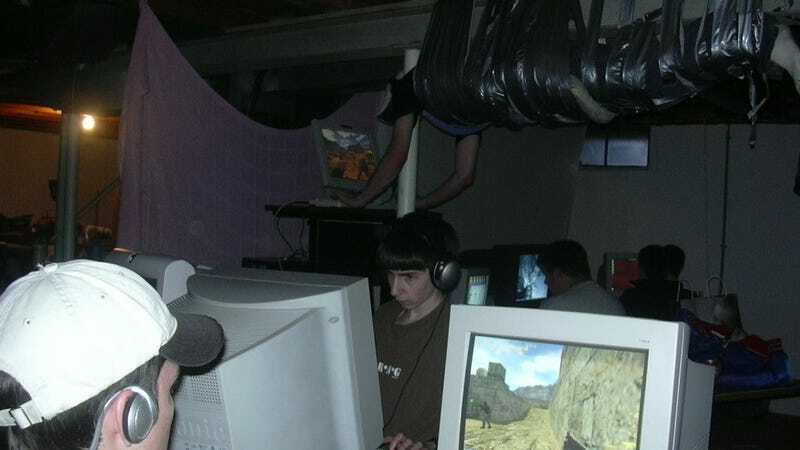 Few photos from the forum ages of online gaming live in greater infamy than one of what appears to be a human duct taped to the ceiling of a dimly lit basement, his arms reaching out to lightly graze the keys of a Dell mechanical keyboard. Many have laid claim to this image. “I was there,” they say. “It was me, I took this photo,” others declared. We reached out to those people—most didn’t respond or couldn’t provide proof. But one thread surfaced: a group of small-town gamers who hauled computers to each other’s houses to play, among other games, Counter-Strike. The picture in question originates from Mason, Michigan, where a close group of friends who liked to build personal computers and organize LAN parties grew up. Through Reddit and email, we were able to get in touch with a large portion of the group, as well as obtain verification and additional images. Through all our interviews, members of the group laughed at the claims of Internet fakers and commenters. The group told me they would hang out together in various houses and, sometimes, even a tire warehouse, lugging computer rigs to locations to play a variety of games. It was the summer of 2002, and at the time, Counter-Strike was the game to play. Others recount games like Command & Conquer, both Renegade and Red Alert 2, as well as Battlefield 1942 (for those with the 512 MB RAM to run it) and StarCraft custom games. Counter-Strike was the great equalizer. It could run on just about anything, and everyone had it. For the Mason alumni, the night they taped Drew Purvis to the ceiling was just an average day, another LAN party with friends. The duct-tape framework is assembled. At this point, the teens gathered the necessary supplies, bought duct tape on a friend’s employee discount and had the tallest attendee, Brian, hold the subject, Drew, aloft while the rest taped him up. What you see in the now-iconic photo is actually the group’s second attempt to suspend their friend from the ceiling with duct tape. After about 10 minutes, the tape digging into his sides, Drew asked to be cut down. They revised their plan, adding pillows, and strapped him back up. Once on the beam, someone else had the idea to stack some tables up so Drew could still play on his computer. Drew lasted about two hours suspended above his comrades before retiring to the ground (turns out a duct tape cocoon runs hot). For the Mason alumni, it’s a little reminder of a simpler time. “It’s so funny, because if you see the Reddit threads, every time this picture goes around every couple years it’s like a little Mason reunion,” said Jonathan Watrous, another LAN-goer. Those mini-reunions in the comment sections of this picture help keep the group together and caught up, long after it splintered and scattered to the wind. Some still try to get together, either online through modern games like League of Legends or in-person. The photo remains an indelible reminder of a time when rigs were dragged into basements and parents were kept awake by the mechanical clacking of keys to the cadence of Counter-Strike.